If you are looking for a relaxing yet exhilarating two day white water rafting tour then this is the trip for you. Start out on the relaxing and fun Class 3 South Fork Lower Gorge on the first day before stepping up on the second day by rafting the Class 4 Middle Fork of the American. This is the perfect blend of relaxation and thrills that would be perfect for anyone. Your first days adventure starts at our Deluxe River Campground, complete with modern indoor restrooms and free hot showers, swimming pool, volleyball court, and more, situated just above Troublemaker Rapid on the South Fork of the American River. Our campground is located next to James Marshall Gold Discovery Park where the discovery of gold in 1848 led to the California Gold Rush. Most rafters typically arrive the day before the rafting trip and camp the night but you can choose to arrive in the morning if you like. Your two-day South and Middle Fork American river rafting adventure begins the morning of your trip with a hearty breakfast at 8:00 AM. After breakfast there is time to let the food digest while you get ready for a relaxing and fun day rafting on the South Fork. The trip briefing will be held between 10:00 AM and 10:30 AM based on the morning’s water release. The Trip Leader conducting the briefing will be able to answer any questions and address any concerns. After the briefing you will be fitted with your lifejackets and helmet, given your paddle as well as a detailed safety talk. After the entertaining and informative safety talk it’s time to get on your raft and onto the river for a day of fun, laughter, excitement, and lots of exhilarating whitewater. The first few rapids you’ll encounter in the morning are small but spirited and will allow you to practice your new paddling skills. You will float by James Marshall Gold Discovery Park as well as the historic towns of Coloma and Lotus. You will spend the morning relaxing and meandering through Class 1 and 2 rapids – a perfect warm up for what is to follow. A huge deli-style lunch to match those big, outdoor appetites will be set out for you by the side of the river. After lunch, we’re off to challenge “The Gorge” and experience the excitement of outstanding rapids such as Bouncing Rock, Satan’s Cesspool, Hospital Bar and Recovery Room. Yes, you will get soaked! Just before you hit Folsom Lake our own Honda Jet Ski will meet you for the tow to the take-out at Salmon Falls – this way you avoid a 2 mile paddle out with a headwind. At the end of the day’s rafting, cold beverages and transportation back to camp await you. At camp you can enjoy a hot shower or free time until we serve some tasty hors d’oeuvres and a delicious healthy dinner with dessert that will satisfy even the heartiest appetite. Spend the rest of the evening catching up fellow rafters and meeting new people. Lounge around your campfire and makes smores before retiring for the night. Your second day of adventure begins early at 7:00 AM, enjoy a delicious continental breakfast before heading off on your Middle Fork rafting trip for a day of thrills, challenges and excitement. This will be a fantastic day – even the shuttle drive to the Middle Fork is filled with incredible vistas steeped in human history. The Middle Fork of the American River is a beautiful river, flowing through rich gold-bearing country, has impressive rapids, including the ultimate in “Big Drops” at the Tunnel Chute Rapid. Here the river descends 80 feet through a very narrow chute. Then you’ll suddenly find yourself underground for 90 feet traveling through a tunnel blasted by the gold miners long ago. Covering 18 river miles, you’ll experience one long, thrilling day on the river on this adventurous trip. We provide you with a hearty deli lunch along the river and ice-cold beverages at the end of your trip. This is a trip you that will last in the memory bank for a lifetime. There are limited spaces available on the Middle Fork. Weekends fill up fast so book soon! 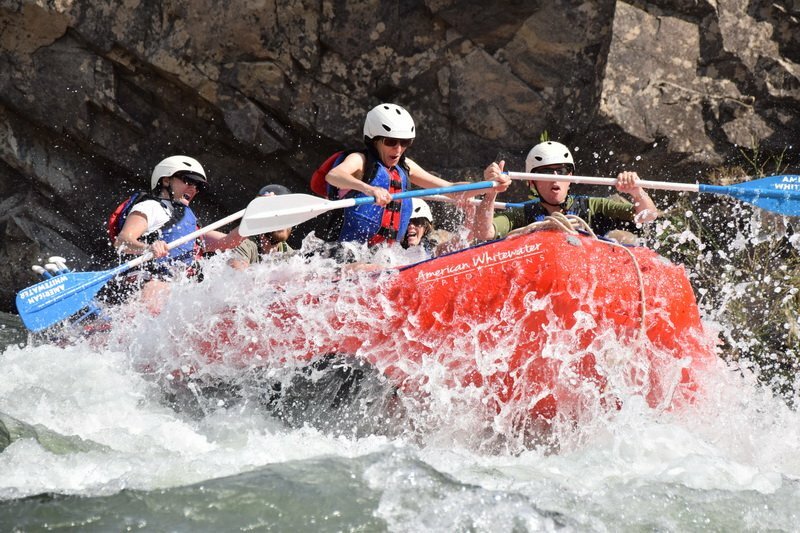 This South Fork Lower Gorge and Middle Fork two day rafting adventure is offered Monday & Tuesday, Thursday & Friday, Friday & Saturday, Saturday & Sunday, or Sunday & Monday. This trip leaves our River Camp on Day 1 at 10:30 AM so it’s imperative that you arrive by 10:00 AM at the latest if you’re not camping with us the night before. Additional night’s camping and meals are available. Please call us 1-800-825-3205 or contact us for details. Get ready for some awesome white water rafting action! Check out our Equipment List for items you will need for your trip as well as Maps and Directions to our River Camp.